Pumpkin desserts are especially popular during the fall and winter months and this Pumpkin Spice Cake is sure to please. 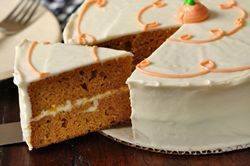 It has two delicious layers of moist and spicy pumpkin cake that are filled and frosted with a maple flavored cream cheese icing. Now, don't confuse pure maple syrup with the corn syrup flavored with artificial maple extract, sometimes called 'pancake syrup'. Pure maple syrup is a reddish-brown aromatic liquid that has a distinctive rich, sweet and nutty flavor. It is produced from the sap of maple trees (in February and March) grown in Canada and the Northeastern United States. Today, there are excellent brands of canned pure pumpkin puree on the market which saves us both the time and effort of having to make our own. But if you would like to make your own pumpkin puree, use the smaller pumpkin varieties like Sugar Pie, Baby Bear or Cheese Pumpkin (approximately 5-7 lbs., 2 1/2 - 3 1/2 kg.). To make the puree, first cut the pumpkin in half lengthwise, remove seeds and stringy fibers, and then place cut-side down on a greased baking sheet. Bake at 350 degrees F (180 degrees C) for approximately 45 - 90 minutes (depending on size) or until easily pierced with a knife. Scoop out the pulp and puree in a food processor until smooth. To extract all the liquid, strain through a cheesecloth lined strainer. Cool the puree before using. Pumpkin Spice Cake: Preheat the oven to 350 degrees F (180 degrees C). Butter, or lightly spray with a non stick vegetable spray, two - 8 inch (20 cm) cake pans. Then line the bottom of each pan with a round of parchment paper. Cake: In the bowl of your electric mixer (or with a hand mixer), beat the butter and sugar until light and fluffy (about 3 minutes). Add the eggs, one at a time, mixing well after each addition. Scrape down the sides of the bowl as needed. Add the pumpkin puree and vanilla extract and beat until incorporated (the batter will look curdled). Frosting: Place the cream cheese and butter in the bowl of your electric mixer, fitted with the paddle attachment (or use a hand mixer) and beat until smooth. Add the maple syrup and confectioners' sugar and beat until light and creamy and of spreading consistency. Add more sugar or maple syrup if needed. Assemble: Place one of the cake layers on your serving plate. Frost with a layer of icing. Place the second cake on top of the first layer and frost the top and sides of the cake. Garnish with whole or chopped nuts, if desired. Refrigerate but bring to room temperature before serving.